Parenting is not for sissies. I can confidently say that now that my children are 14 years old and 11 years old. What I have learnt along my parenting journey and having consulted with hundreds of parents, is that children thrive on boundaries as boundaries give them a sense of security as they always know what to expect next. When there are no boundaries a child feels lost and insecure, however what is very important is that the boundaries are fair, age appropriate and that the parents work together as a team. An age appropriate day time routine is vitally important as in most cases, the success of your child's night, and thus your night, is determined by the day, so if the day time routine is not age appropriate then there is a good chance the night will be a mess. An age appropriate day time routine means you are working with your child's natural bio rhythm as opposed to against it. For example, the age appropriate awake time of a 6 month old is normally 2 hours. This is the length of time a 6 month old can happily stay awake for, emphasis on happily. If he stays awake for longer than that then in all probability he will go into overstimulation - rubbing eyes, pulling ears, squirming, niggly and irritable, and from overstimulation he will progress into hyperalert - clenching fists, fussy eater, stiffens the body, arches the back and cries inconsolably. One of the biggest signs of hyperalert is a baby who looks like the Duracell bunny, bright eyed and bushy tailed, and who battles to fall asleep unassisted and battles to stay asleep. So what does this all mean? It means if your baby hasn't had enough sleep during the day according to his age, he has therefore been awake for longer than what his body can cope with, so come the end of the day he goes into hyperalert and the knock on effect is that he wakes up through out the night, it's a very restless sleep and often a baby will wake at 4am and he's ready to start his day! Sleep induces sleep, the better a baby sleeps during the day the better they will sleep at night time. When a baby sleeps, and it's the correct kind of sleep, his body will produce serotonin which is a hormone that makes a baby grow, so while your baby is sleeping he is growing. The correct length of time for a day nap is 1½ hours per nap, if your baby sleeps for less than that then he is cat napping and this will eventually have a negative effect on the rest of the day and through out the night. Below is an example of one day sleep of 1½ hours. The first 15 minutes is the baby's first light sleep cycle where he will be drowsy. From there he will drop into his first deep sleep cycle of roughly 30 minutes and then he'll come up to a second light sleep cycle, this is at 45 minutes from which he should drop back down to a second deep sleep cycle of 30 minutes and then come up to a light sleep cycle and wake up. It's very common for a child to wake up in a light sleep cycle, i.e. the 45 minute mark, however they need to be able to put themselves back to sleep by themselves. From 4 months of age, if a baby is healthy, he's on an age appropriate day time routine and there are no bad habits, a baby can sleep 10 - 12 hours continuously at night, so effectively they are successfully linking the above sleep cycles continuously. If a baby is waking up 7 times a night, like mine did, and he is healthy and you know there's nothing wrong, then what's happening is he is waking up in the light sleep cycles and then the only way he knows how to go back to sleep is if you pat/rock/feed/drive around the block, in order to get him back to sleep. Implementing an age appropriate day time routine simply means you as parents are implementing a boundary that is in your child's best interests. If a child is reliant on patting/rocking/feeding in order to fall asleep, and you feel you need to teach your child the art of falling asleep unassisted and remaining asleep, then you need to implement sleep training. Teaching a child to fall asleep unassisted and to remain asleep is a life skill which he will take through to adulthood. Sleep training is just another boundary that you as a parent will be setting. You actually don't stop setting boundaries until they leave home, and they don't stop pushing the boundaries until they leave home. Many parents balk at the idea of sleep training, however if done after having had a consultation with a specialist in this field, and it's implemented correctly on a healthy child, in a loving and caring environment by parents who know they have met their baby's needs, they fully understand what they are doing, why they are doing it, how long they need to do it for, and sleep training is implemented in conjunction with an age appropriate day time routine, then there is no reason why implementing this particular boundary won't be successful. There are various sleep training methods available to parents. Baby Love has two different methods, a firm approach and a tender approach and we always explain both methods to our parents so that they can decide which technique they feel more comfortable with implementing. Having said this, Baby Love believes that sleep training can't be done in isolation. 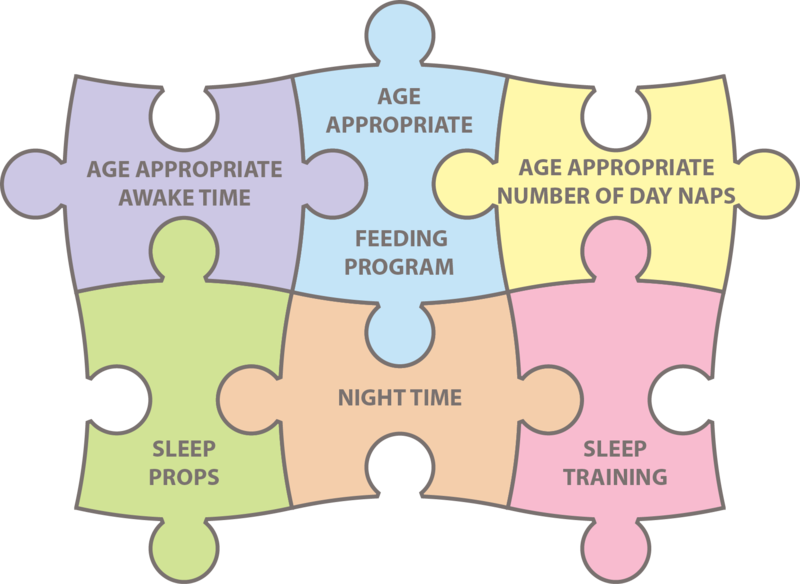 Baby Love believes a parent needs to take a holistic approach and view all the pieces of the puzzle and fix where necessary, before sleep training can be implemented, and that is why sleep training is the last piece in the Baby Love Puzzle. Once a baby is able to fall asleep unassisted and link his sleep cycles, when he wakes up he will be well rested which means he will be happy, he will feed well, he will be full of energy and he will be open to receiving stimulation. When he sleeps his 10 - 12 hours continuously at night he will wake up in the morning well rested and so the day starts off on a good footing. Because the baby slept 'like a baby', it means the parents would have to, so they wake up well rested and happy, they are fully of energy, they can function at their optimum as a mom, dad, wife, husband, friend and work colleague. The family is a well rested and therefore happy family. From what I have learnt as a mom of two very strong willed children, is that if you don't implement boundaries from a young age, and I mean from babies, then you are by default teaching your child that what ever he wants he will get and sadly that is not how the real world works. By setting fair and age appropriate boundaries from when they are little will make the parenting journey so much easier and joyous, because when your 4 month old is now 14 years old and you implement a boundary, because this child has been raised with boundaries, he will be far more accepting of the boundary, even though he will probably still give you attitude, compared to a child who has never been raised with boundaries. There are different parenting styles and Baby Love believes there is no right way or wrong way to parent, it is different strokes for different folks, but every parent has one thing in common, and that is they want what is best for their child, and this sometimes means being firm, but loving, when implementing boundaries. Baby Love is passionate about making the parenting experience as joyous, fulfilling and happy as possible. It's not all about sleepless nights and screaming infants - there is so much more! Baby Love is not a quick-fix solution - nothing worthwhile ever is. But it works and it makes a HUGE difference to the way parents perceive the parenting experience, and that is our goal - to enable parents to apply their natural intuition, together with proven methods and principles, to create a rich, rewarding and stable life for the whole family.